Shanah tovah u'metuka - these words express wishes for a good and sweet new year. We actuate these sentiments by dipping apples in honey, eating rich raisin-dotted bread, and reflecting on a year gone past. While the round loaf of challah bread represents the continuity and cyclical nature of a year, the honey is a reference to a 'land flowing with milk and honey' - Israel. Many other Jewish holidays also embrace sweetness, prescribing more ritual consumption of honey, dairy, and fruits. 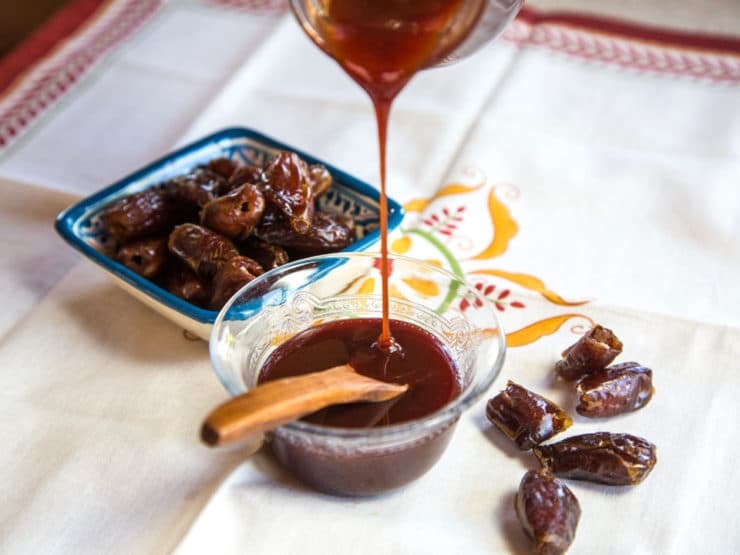 We often, however, overlook the fact that the honey alluded to in biblical texts is not the bee-derived syrup so commonly used today, but rather a sweet liquid made from the fruit of a date palm. The date palm is suggested as the oldest cultivated tree, potentially originating in presentday Iraq, and feeding the populace of the Middle East for upwards of 8,000 years. But an equally extended history with humans exists for honey produced by bees, as well. Pre-dating the advent of agriculture by a hair (it is a forageable food), honey was probably first stolen from the hives of wild bees a bit more than 10,000 years ago. Apiarists may have started cultivating colonies in ancient Egypt, or perhaps back even further as documented in cave paintings. It was fit for gods, used as currency, and replete with medicinal properties. This is a sticky topic for a vegan. Yet while the staunch abstainers point to the poor oppressed worker bees, the fruits of whose labour are then cruelly seized, I'd argue that conscientious honey consumption is a more environmentally responsible. Local and in moderation, a recipe for healthier pollinator populations and more resilient ecosystems. While not quite at the level of concern as the recently declared endangered bee species in Hawai'i, bees do face huge pressures from habitat loss, pollution, pesticides, and more, while also playing pivotal ecological roles. We can do far more by supporting local cultivators who try to build a better environment for people and apids, than by boycotting the industrial segment. Let's leave it at that! 1. Mix oil, coffee, milk, and sugary substances together. 2. Sift in the dry ingredients and then combine just until everything is incorporated. Fold in sliced apple or walnuts, if desired. 3. Transfer to a large cake round or two loaf pans. Bake for 35-45 minutes at 180°C, until a knife comes out clean. Don't overbake! Allow to cool completely. Feeling happy by reading this article.